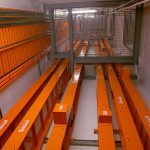 With the Kent St Telecommunications Facility being one of the most critical sites in Australia it comes as no surprise that the demand for power and the importance of emergency back up power generation be key factors in the daily operations of this multi story facility. Ryan Wilks were engaged to provide an installation solution to a detailed design provided by one of Australia’s leading consulting firms. With tight time constraints the challenge was set. 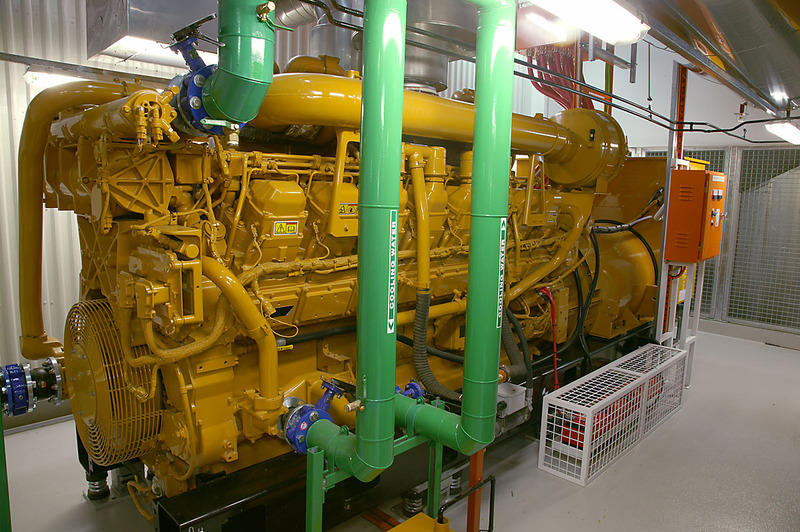 The installation involved three new Caterpillar 2.38MVA 3 Phase Generators and associated equipment. Without hesitation Ryan Wilks put the wheels in motion and began to co-ordinate with the assistance of Borger cranes a crane lift which was to surpass some of the biggest crane lifts the city had ever seen. With the use of the largest mobile crane on the East Coast of Australia that being a 500Tonne Mobile Crane which took some 20 trucks to transport all of the associated booms, hooks, counterweights and some seven hours to erect. The lifts had been co-ordinated with timing precision, the setting of the crane surveyed, checked and re-checked the only indefinite factor being the weather. Apart from the rain on the day causing minor delays the lift went off without a hitch. 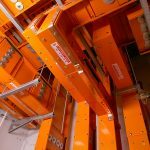 The first to piece of plant to be lifted was one of the Generators weighing a massive 12,000 Kilograms, lifting to a height of 16 levels and then lowering through a small discharge penetration in the roof proved tedious. The final position of each piece of plant needed to be done quickly to make way for the next lift. 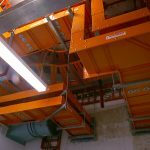 After the third generator landed it was to be the positioning of the 3 remote radiators and heat exchangers which were closely followed by the insertion of the attenuators for the discharge air to fill the roof penetration and topped off with the discharge hut. The completion of the roof saw the supply air fans and the full reach of the crane being employed to land the fans in the desired locations. With each generator positioned just before Easter it wasn’t long before ancillary equipment started to get connected to each machine in quick succession. With today’s emphasis being on the environment it was of no surprise that Catalytic Purifiers were installed in the exhaust system of each engine. 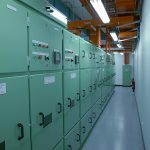 A Vass Electrobar Busway system comprising of 4000 amp rated busbar from each engine to the SGP (Standby Generator Plant) Main Switch Board was installed promptly, adding to the kilometres of busway already installed within the facility. The system operates as dual redundancy which is a stretch from the original N+1 arrangement usually applied within such a strategic facility. Redundancy and fail safe being considered as the most important factors meant the use of a highly technical control system designed to make the operation of the generators user friendly and breaking the system down to a one button operation for any operator. 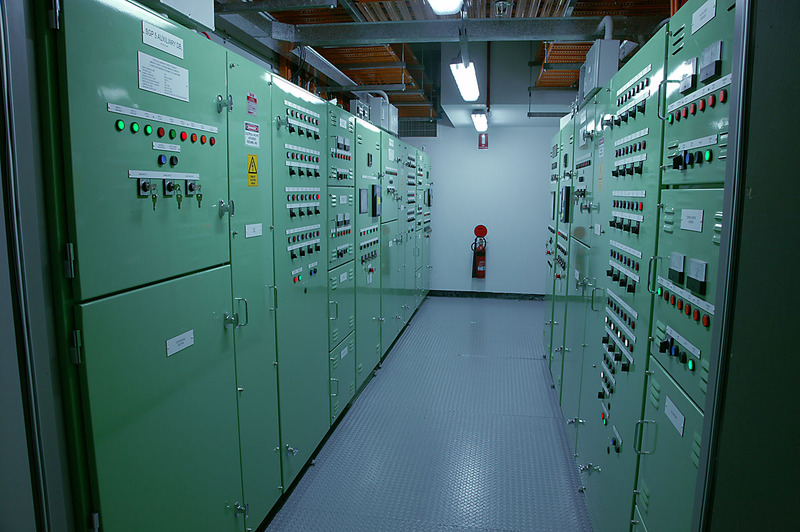 For the first time in Australia we saw the use of two Woodward EzyGen Controllers for each set. The controllers are set to automatically cycle on the first day of each month from one to the other ensuring full operation over the lifetime of each. 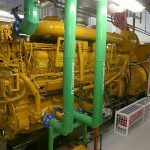 This ensures that in the event of a catastrophic controller failure the redundancy of the secondary controller will always make the generators operational. The auxiliary control specified an advanced PLC network so that each Auxiliary Switch Board could not only communicate with each other but also display full functionality of auxilliary equipment and operation of each generator on the Master Sync Panel display. 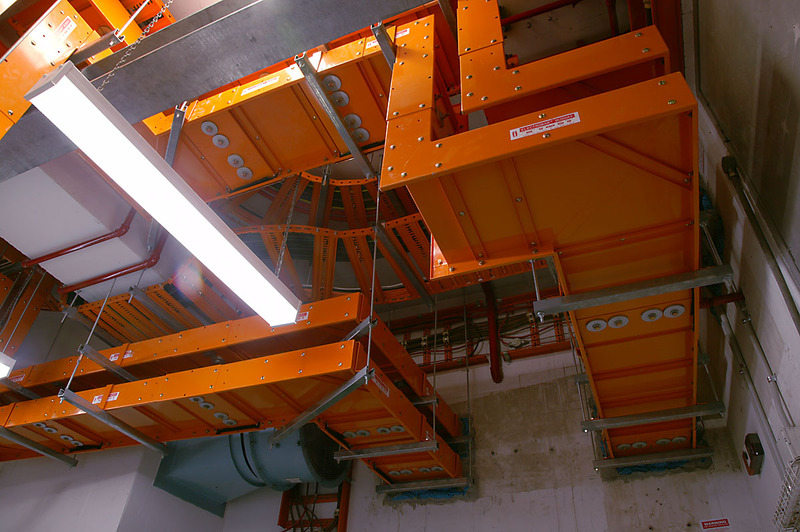 An optic fibre was utilized to communicate between the Auxiliary Switchboards and the Fuel Control Panel located some 17 stories below within Basement 3 level. Ethernet to Fibre converters at each end convert the signal between the Fuel PLC and the Master PLC. 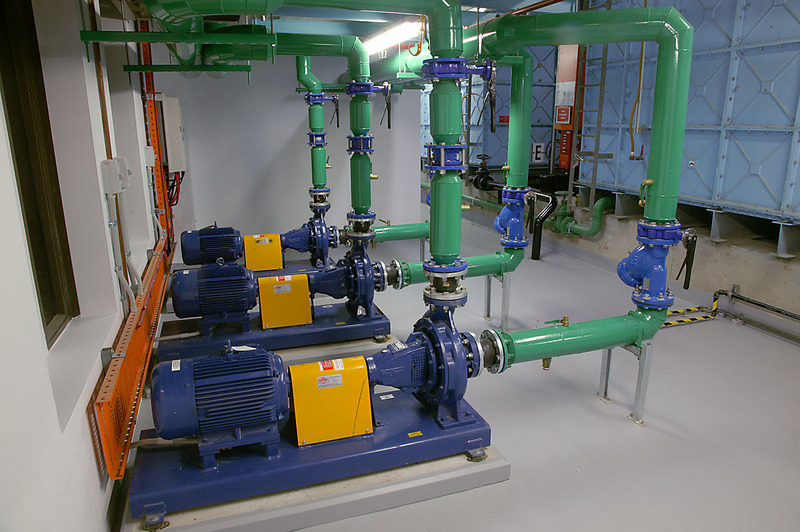 As air flow is extremely important for the dispersing of heat within the generator room and supplying air to each machine, a six fan supply and discharge air system was employed with wrap around bypass control features on the variable speed drives. Ryan Wilks were provided with CFD 3D modelling to assist in determining correct air volumes and specific air flow paths. 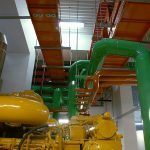 Fantech fans provided the specific air flow requirements and utilising Belimo Volume control dampers and ABB variable speed drives. Ryan Wilks integrated the system with full compliance to the design specification. The speed of the fans was driven by individual variable speed drives. 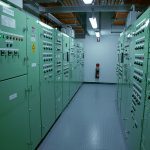 The control of the VSD’s was taken across an average of the RTD’s (Resistive Temperature Devices) as the temperature within the room rises and falls the fans react accordingly. 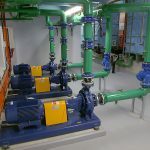 The fuel system employed was a complex yet user friendly system installed to incorporate the supply of fuel from three Ebsray MD100 Fuel pumps, a back up fourth pump having the ability through a series of solenoid valves to fill each new 800L day tank in the event of failure of any of the dedicated pumps. 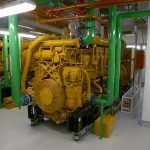 As fuel quality is an important factor in the longevity of each machine a series of Morrison and Morrison Debug filters were installed in each supply line along with Fuel Water separators and Dahl Filters, topping off a complete fuel laundering system increasing the storage life of the diesel fuel and running life of the generators. Rising some sixteen stories the pumps were sized accordingly based on the head pressure and the required flow rate to ensure the generators always have a readily available supply of fuel. A Honeywell fuel monitoring system and fire safety feature enables the shutdown and control of each set under extreme situations. Through a Tracetek Leak detection system, pressure transducers and flame detection, each individual generator and associated leg of the fuel system could be monitored and controlled in the event of a machine fire and fuel leakage or loss in head pressure within the supply lines. 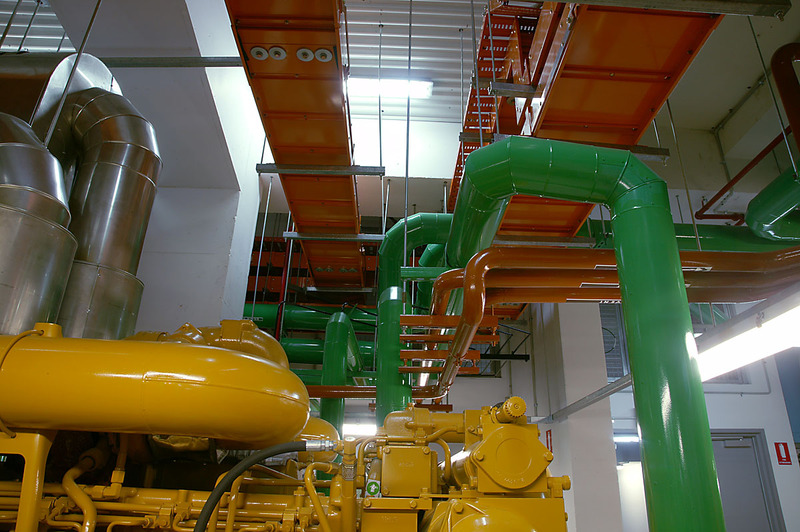 In the event a fault is detected the associated machine will be shutdown, fuel supply to the set isolated and the associated day tank drained and fuel returned to the two newly installed 40,000 litre bulk fuel storage tanks located within the Basement 3 level. The fire mode operation design forces the Exhaust Air fans to operate automatically under fire zone alarm. Each discharge fan under fire conditions will operate at 100% capacity, in the event that a generator be required to start all fans, supply and discharge will operate. With importance being placed on testing and commissioning, a stringent 4 week commissioning process was instilled leaving no scenario unchecked and a full system capability was carried out. 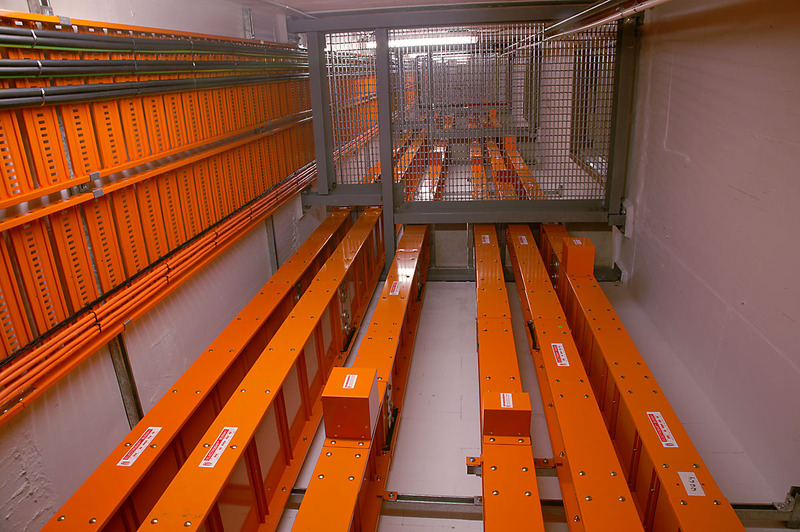 Resistive and Reactive load banks were positioned on level 14 and connected to each busway rising through the building. These busways were installed under a separate contract by Ryan Wilks under the new Electrical Reticulation Installation. 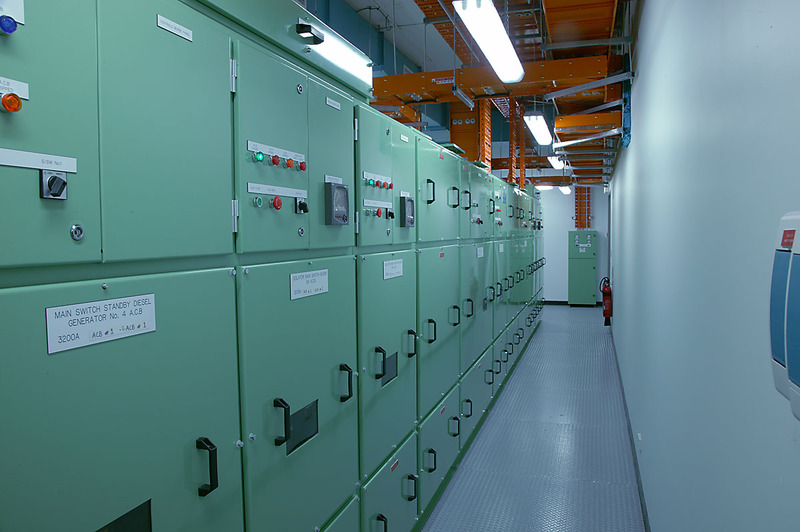 Each generator was put through its paces and loaded to 110% at a 0.8 Power Factor. Scenario testing being the key to the successful operation of the system as a whole enabled Ryan Wilks to put the system and its capabilities through complete functionality testing. Every scenario possibly thought of was conducted to enable full compliance of the system under design and operational conditions. 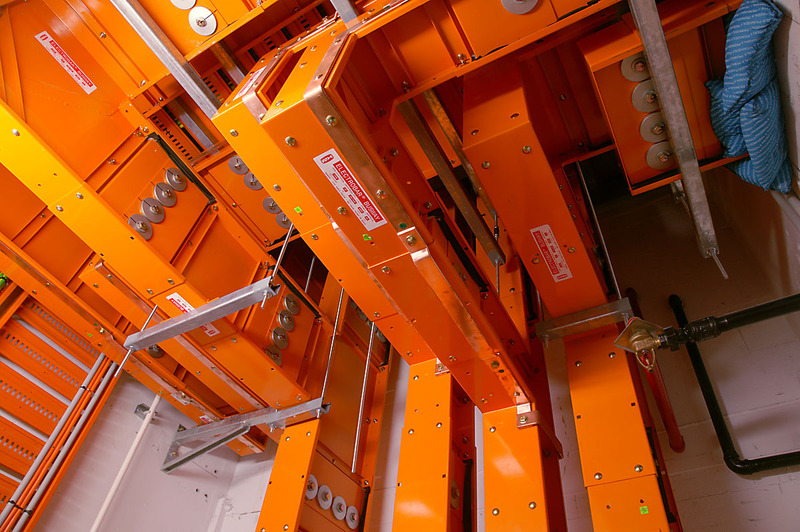 With automatic synchronization and load sharing abilities, sets were failed, brought back online, fuel was called for manually and automatically, smoke and flame detectors were set off to prove operation of fire modes and fuel safety features. 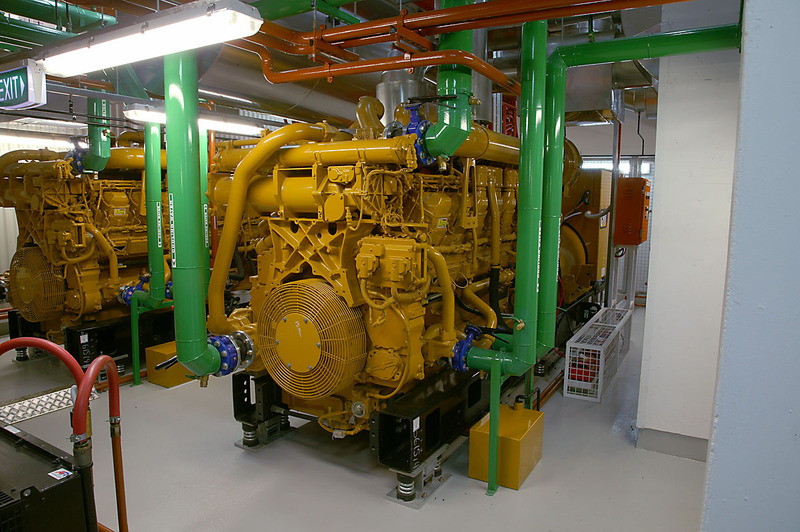 The key to the success of the installation of the three caterpillar engines and all the ancillary equipment was the importance placed on forward planning and timing. The end result was a complete installation to a quality mentioned by all as one to be proud of and a showcase within the Telecommunications Industry.